This remarkable scope combines a wide field of view and legendary Nikon performance with the latest in reticle system technology. This M-223 riflescope provides AR shooters a versatile power range and Nikon’s new BDC 600 reticle. This M-223 2-8x32 provides unprecedented speed in dialing in your shots for virtually any known distance—from zero out to 600 yards. The M-223 is now compatible with Spot On Custom Turrets -- a practical way for shooters to compensate for bullet drop and make accurate long-range shots. Each Spot On Custom Turret is personalized for an individual shooter based on ballistic information he or she enters on the online ordering page. Select your ammunition, riflescope, typical atmospheric conditions and much more to create your own uniquely calibrated turret. Developed specifically for the trajectory of the .223 Rem 5.56 NATO round with 55-grain polymer tip bullet, the new BDC 600 reticle offers shooters unique open circle aiming points and hash marks from 100 to 600 yards. Nikon has engineered the entire optical system to provide the shooter with a bright, sharp, incredibly flat sight picture and light transmission up to its theoretical maximum—95%, allowing for a clear sight picture from dawn to dusk. Positive click reticle adjustments get you zeroed in quicker and maintain your setting—even with repeated recoil To simplify field adjustments. Just sight-in as usual, then lift the spring-loaded adjustment knob, rotate to your “zero”, and reengage. Field adjustments are now as simple as dialing-in your subsequent ranges. Every model features an impressive 4-time zoom range and four inches of constant, non-critical eye relief, even at extreme shooting angles. A massive ocular lens delivers a huge, exceptionally bright, high-resolution sight picture. Developed specifically for the M-223 series of scopes, this special mount (sold separately) fits Picatinny rails found on most flattop AR’s. Constructed with lightweight alloy and a built-in 20-MOA incline to maximize elevation for extreme long range shooting. 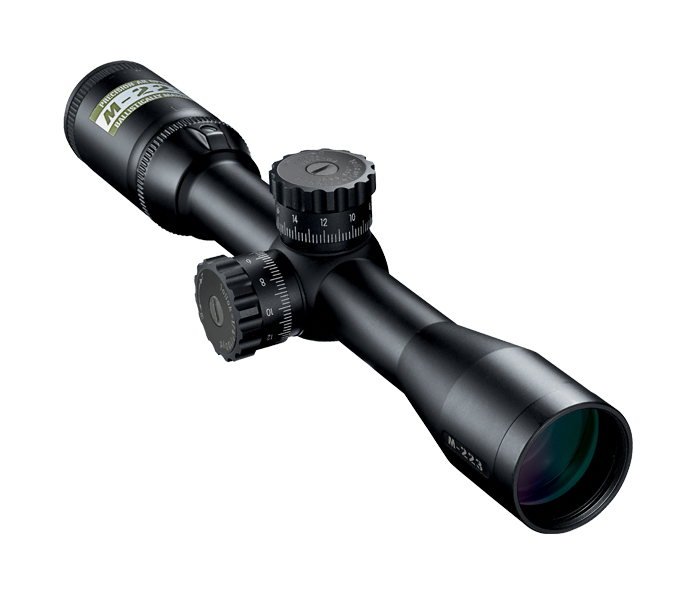 For minimum weight and maximum strength and durability, Nikon builds these scopes from aircraft grade aluminum alloy with a one-piece main body tube. Many M-223 models can be mounted to virtually any rifle action regardless of the actual caliber, even magnum length actions.